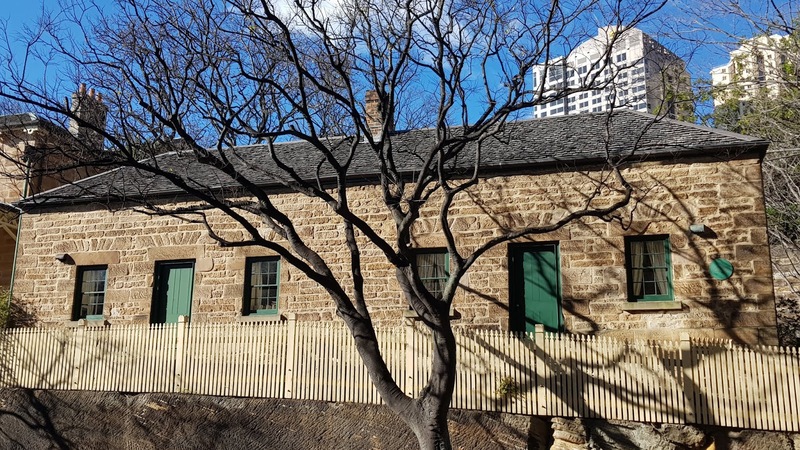 The "Glover Cottages" are located on top of a rock shelf above Kent Street, in the inner city suburb of Millers Point. These heritage listed, semi-detached stone cottages were built in 1820 as part of a group of buildings owned by James Glover. Some of these were demolished and redeveloped in the 1880s, while more were demolished during the black plague resumption works in 1900, with only Glover Cottages surviving. It features one of the one hundred and one green plaques which were erected around Sydney in 1988, celebrating historic places, people and events. Linked to: Fences Around The World, Thursday Doors, Signs, Signs, All Seasons. A good thing that this was saved. And a tragedy the others were not. ...a beautiful stone building, I like the green doors and windows. I love stone buildings. This one is beautiful, so glad it was saved. Thanks for sharing the photo and the history. I really loke the old buildings in that part of Sydney. Joan, it's great that so many buildings have survived in this area. I love the old stone Glover cottages. Thank you for sharing these beautiful buildings with All Seasons! I wouldn't think as Austrillia having anything to do with black plaque. Dora, I never knew the history of Black Plague in Sydney until I started researching about the history of some buildings in the inner city.